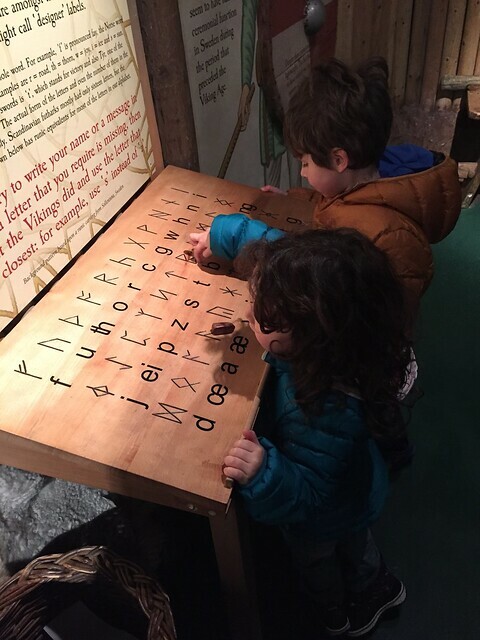 This Dublinia review is based on our experience at the museum when our kids where 4 and 6. Find out all you need to know about Dublinia Dublin including what to expect, how long to stay there and age suitability of this family attractions in Dublin. Maybe it’s because of the horns, or possibly the hairy appearance and the dragon-shaped boats, but few civilisations spark the interest and curiosity of children more than the Vikings. 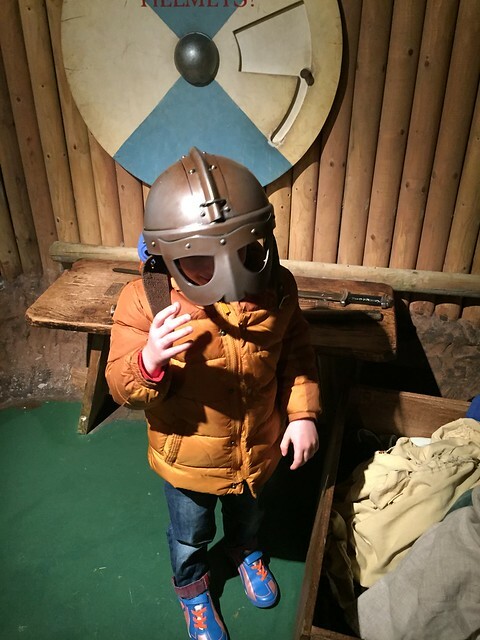 So when we found ourselves looking for a family friendly activity in Dublin, to escape the wintery weather and to spend some quality family time with the kids, we decided for a visit to Dublin’s Viking and medieval history museum: Dublinia. As we expected from reading the description on the museum website, Dublinia proved one of the best museums in Dublin for children and also a fun and informative day out for adults. Our Dublinia review: is Dublinia fun for kids? Dublinia is located in Dublin city centre, just in front of one of Dublin’s main historical landmarks, Christchurch cathedral (which you can visit purchasing a joint ticket). It is built on the site of the medieval church of St Michael and its rooms are hosted in the former synod hall of the church of Ireland, dating back to 1875. You enter the museum from street level but the exhibition is organised on three floors: the ground floor is dedicated to Viking Dublin, the first floor is about post-Viking, medieval times and the third floor digs deeper in the technical aspects of excavation and history hunting. The whole museum is built with the aim of getting you to really experience what Dublin must have been like in the past: the exhibition is laid out in chronological order and the displays are a mix of informative and interactive panels designed to capture both the interest of adults and the imagination of children. If you are interested in more child-friendly museums in Dublin, consider a visit to the so-called ‘dead zoo’, Dublin’s natural history museum. The first room you enter is about Viking times and it brings you back to the 9th – 10th century a.D. The most common image of Viking life is probably made of hairy and feral looking individuals scouring the North see on long boats. 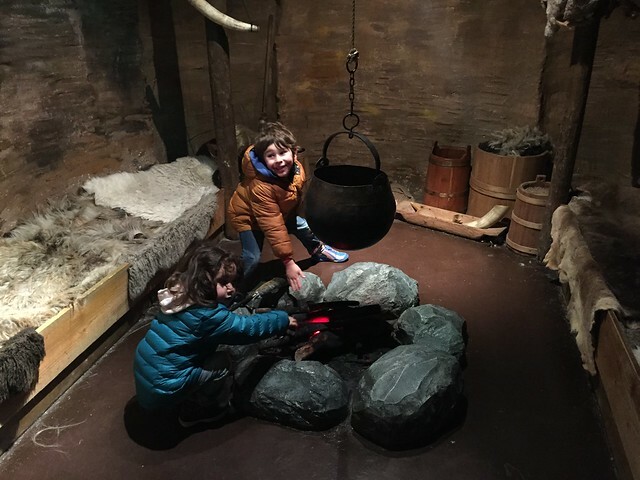 However, as soon as you step into their reconstructed times in Dublinia, you learn that many of our Viking stereotypes are misconceptions and there is way more to their society that bloodthirsty expeditions. Vikings were excellent sailors but they were also excellent traders and often created busy settlements and trading centres where raw materials were exchanged. Dublin was one of these settlements and it is this first busy hub of activity that slowly developed into the city we know today. 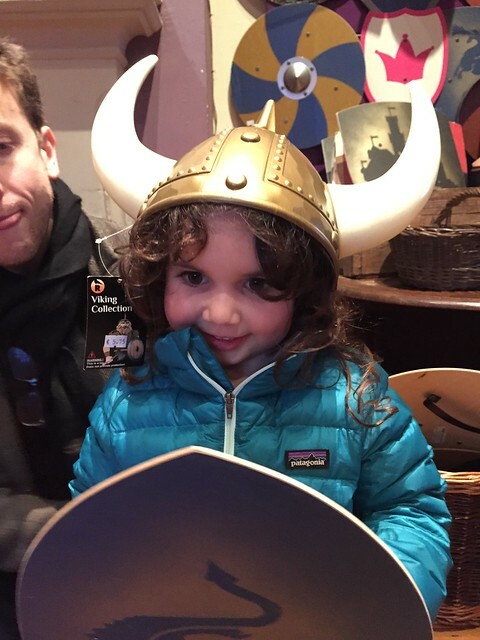 A fun touch: to make the exhibition truly interactive, Dublinia included a chest full of Viking clothes that kids and adults can try on. 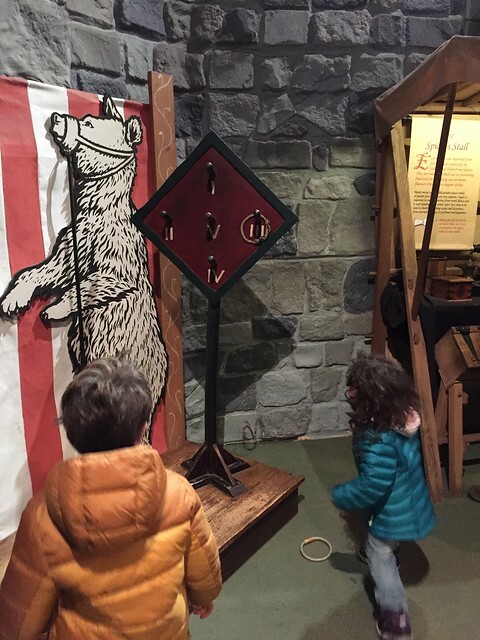 The kids found this hilarious and since the chest is immediately on your right when you first enter the first room, it worked to spark interest and curiosity for the rest of the museum, setting the tone for the visit. When we saw the clothes chest, we knew straight away this was a perfect activity for a rainy day in Dublin! Something I did not know: the famous horned helmets were not battle gear but rather celebration apparel! What do YOU look like with horns? As you keep going, you cross a reconstruction of Viking Dublin and can have a peek at Viking homes. The kids had a blast running up and down the Viking street and while they laughed their heads off at the reconstructed artifacts and life-sized figures, we parents were able to read the historical panels explaining the history of the time and the events leading to the famous ‘battle of Clontarf’ that in 1014 marked effectively the end of the Viking era of Dublin. The second floor follows very much the same interactive layout of the Viking section but moves in time to medieval Dublin. 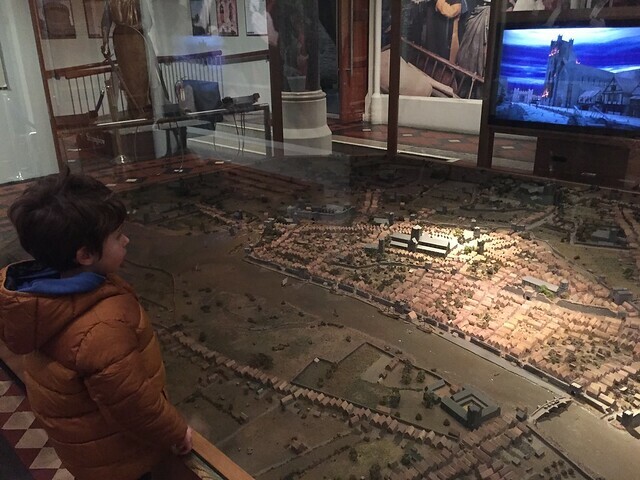 If you are a lover of maps, this floor starts with something that is sure to capture your attention: a 3d scale model of the city as it looked in the middle ages. This floor was probably the one our children enjoyed the most. It includes a reconstruction of medieval houses and shops, it makes you discover remedies for ailments such as toothache and fever (the kids were not sure about the ‘dentist’ thongs!) and it makes you have a go at medieval games. We play medieval games and have a blast! On the third floor, the exhibition has a different character and digs deep into the work of archaeologists and historians. It shows how excavation work proceeds, how to extract information from materials and crafts and the sometimes difficult relation between archaeological discovery and modern busy life. The third floor has a strict no-photography policy, but follows a similar interactive principle as the floors below: my kids are probably a little bit young to fully appreciate this floor but were nonetheless taken by the skeletons and the digging display. At the end of the exhibition, you emerge into the cafe and gift shop from where you will also find access to the top of St Michal’s tower. The tower is accessible by a metal staircase and at its top offers a view over the city. When coming out of the museum, you will cross the bridge connecting St Michael’s to Christchurch and stepping down the stairs you will find yourself in front of the cathedral entrance. Short of time we did not enter on this occasion but the visit is worth it and I would highly recommend buying a combined ticket to make the most of your visit. I hope you enjoyed this Dublinia review. Safe family travels! Please note: this Dublinia review is unsolicited and unbiased. I received no compensation for it and we purchased our own tickets. However, before publishing the post I did seek permission from Dublinia to share my photos. I wish to thank them for availability. I hope you will all enjoy a visit to such an interesting and entertaining museum!